UNITED NATIONS, October 8. /TASS/. 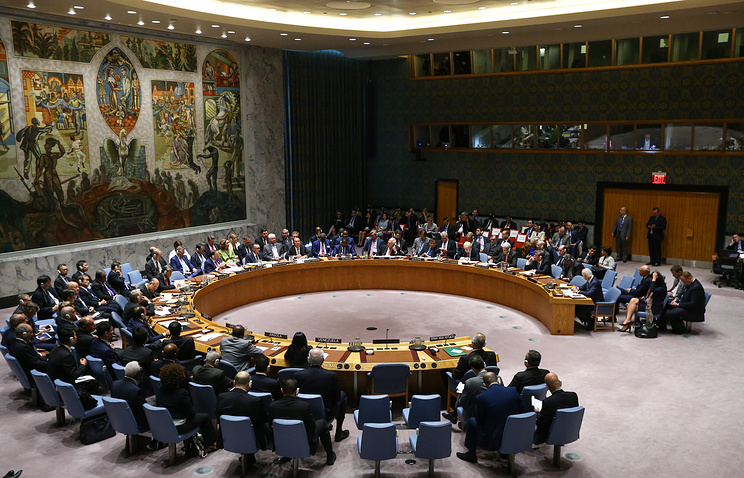 Russia has submitted to the UN Security Council an alternative draft resolution on Syria, the Russian Permanent Mission to the United Nations said on Saturday. "An alternative Russian document will be considered after voting on the draft resolution proposed by France," the mission's press service said. The UN SC session initially planned to be held at 10pm Moscow time has been rescheduled to 9:30 pm, the mission added. The Russian draft resolution, a copy of which was obtained by TASS, expresses support to the proposal of UN Special Envoy for Syria Staffan de Mistura on withdrawing militants from the Jebhat al-Nusra terrorist organization (banned in Russia) from east Aleppo. The document also asks UN Secretary General Ban Ki-moon to present to UN SC a detailed plan of implementing this initiative in cooperation with interested sides with the aim of being approved by the Security Council. The draft resolution proposed by Russia also calls on all sides to implement the Russian-US agreements on Syria reached on September 9. They call for cessation of hostilities and creating conditions for providing humanitarian aid to the population.